Quin the cat is recovering after surgery. A cat has lost a leg after getting caught in an illegal animal trap just outside Limavady, Co Londonderry. Quin the cat had to have his front leg amputated after it became horrifically damaged by a vicious animal trap. Now recovering, he is still very wary and subdued after the terrible ordeal he has been through. A passer-by spotted the cat in distress at farmland just outside Limavady. The North West Animal Welfare Group, an animal charity in Limavady helped rescue him. Volunteer Letty McCormack was one of those who went to help. She said: “We spent about three hours in the fields and we couldn’t get him, we couldn’t get to him. 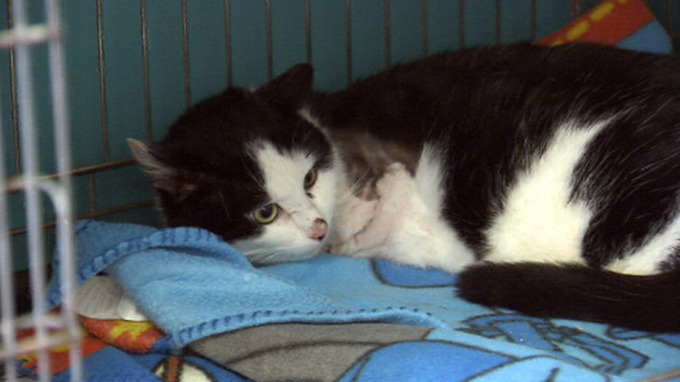 A vet was called but it was clear that the cat’s left foreleg had been crushed by the trap. Letty has named the cat ‘Quin’, which is a nod to the Ballyquin Road where the feline was found. The animal charity is now appealing for a new owner for him.